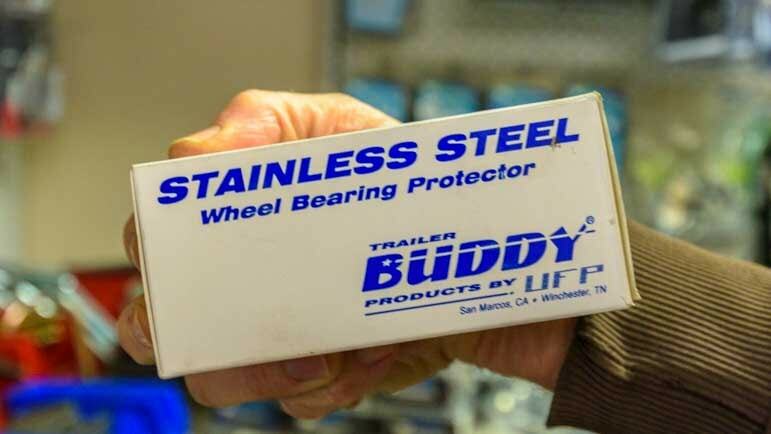 This entry was posted in RV & Boat Projects & Upgrades and tagged Full-time RV Lifestyle, New, Non-Travel, RV Product Reviews, RV Tech Tips, RV Tech Tips Trailer, RV Technical Topics, Trailer Suspension by Roads Less Traveled. Bookmark the permalink. That is a great story. I would have never figured on the tossing of everything in the trailer. I was a bit shocked at the damage to that part on only 7500 miles. Good thing it was replaced with a better system. I was a bit disappointed that Mark wasn’t doing the work! Just kidding. Way too many tools required for that job. You guys always seem to find very qualified repair shops. Things do jiggle a lot with an RV. Some folks say driving an RV down the road is like putting your house through an earthquake! But the MORryde smooths things out a lot — much much more than we expected! We too were shocked that the old equalizer had been damaged so much in just 7,500 miles, but it may be from driving on one particular road. It was truly the worst we’ve ever been on, by a long shot! Surprised THE BOSS was content to nap !!! I also have a 36′ 5th wheel trailer and go down may bumpy roads to reach boondocking spots so your article really caught my attention. Can you tell me how much this upgrade cost to do? 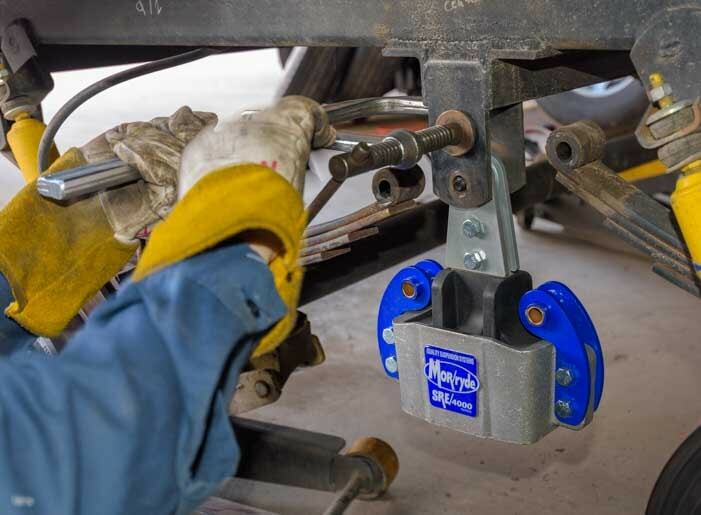 Depending on whether you want to install the optional heavy duty shackles and steel cross member, it will range from $400 to $600 for parts, and depending on labor rates probably from around $300 to $500 for labor. Great review and recommendation. I can’t wait for the snow to stop…so we can get back into our 5’er and make some improvements before coming out fulltiming. I am so dying to start full timing….I cannot wait for Sept. to get here. 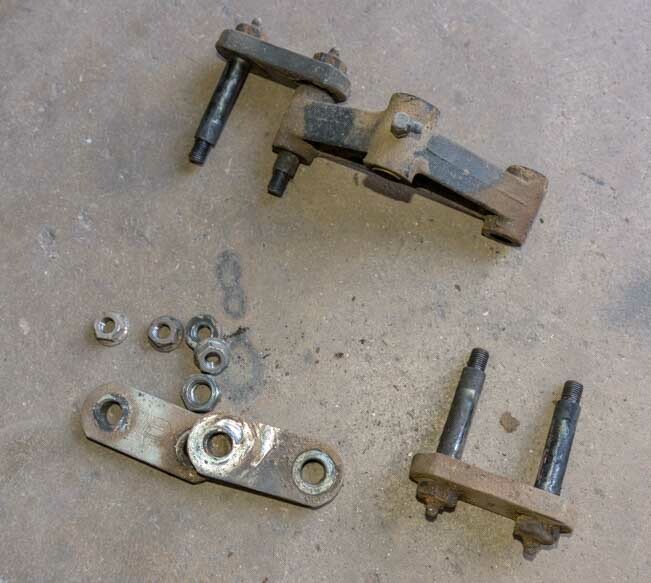 I will also use RTW for a possible disc brake install. 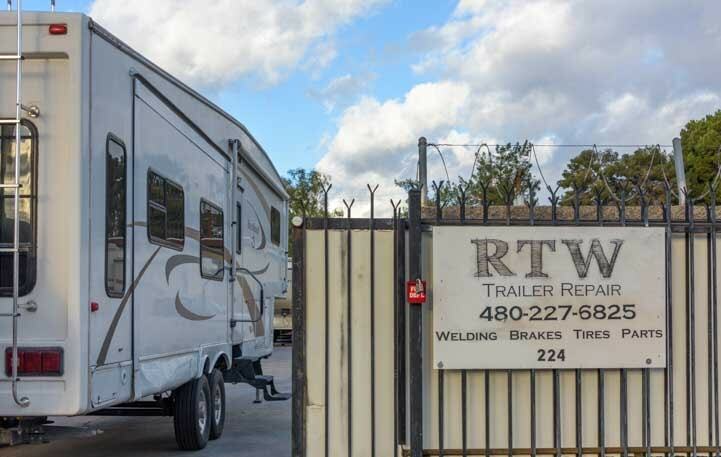 I feel a good trailer shop that knows about rigs is so much more important. Many thanks for a great article!! You are welcome, Mike. September will be here in no time and you’ll be off on new and exciting adventures! 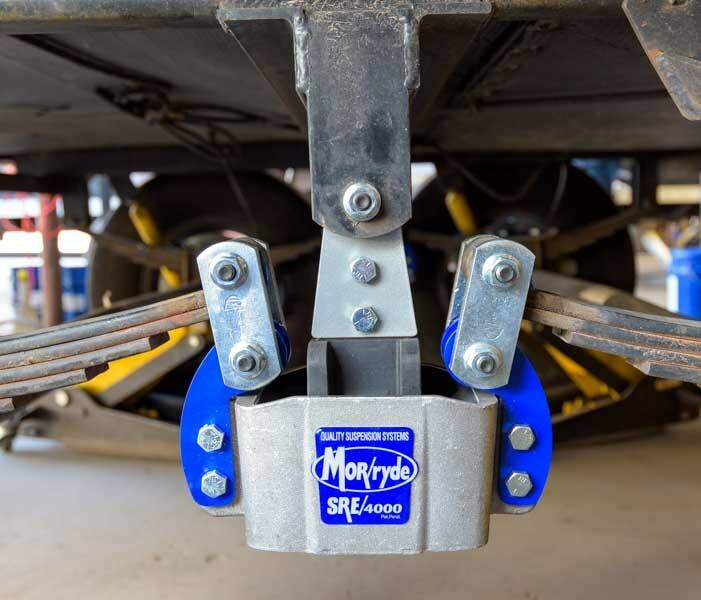 Disc brakes make a world of difference with a big fiver and you could do both brakes and a MORryde install at RTW in one shot and save a little on the labor of getting the trailer jacked up/down and wheels off/on. We are sure loving our little puppy. He puts a special brilliance and warmth into every day. Enjoy your travels — it won’t be long! I’m surprised to see seven leafs in your springs! 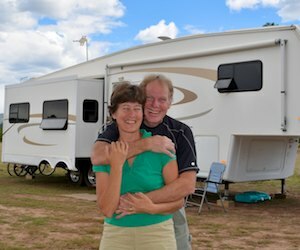 Like you, we take our home many places that most RVers would never go. 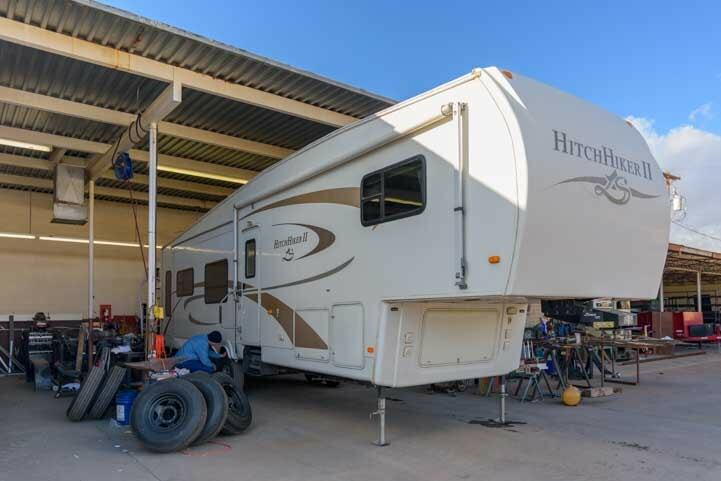 Our 33′ fifth wheel weighs about 13,000# loaded (we weighed it after our first year on the road) and we only have four leaves times four. 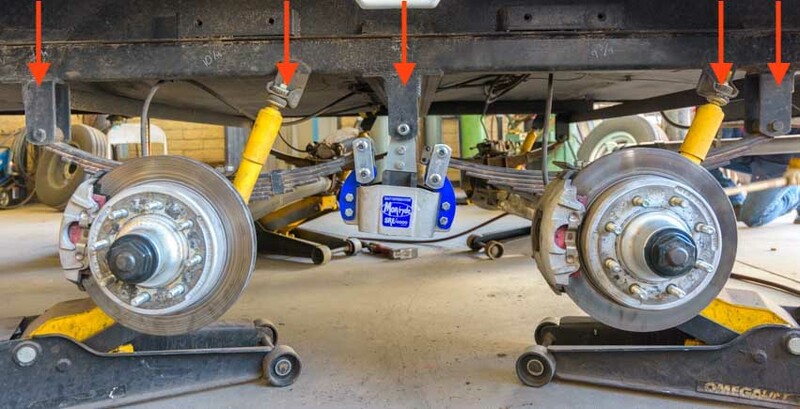 If your springs are rated at 8,000# times four, that’s 32,000# potential — seems way oversprung to me which I’m guessing has been causing problems for some time now. As an example, my 3/4 ton Camper Special pickup had seven leafs and they rebuilt both sides with nine but I was hauling a monster slide-in truck camper with all my work tools and equipment in it at the time. And riding in that truck without the camper on it was *not* pleasant. 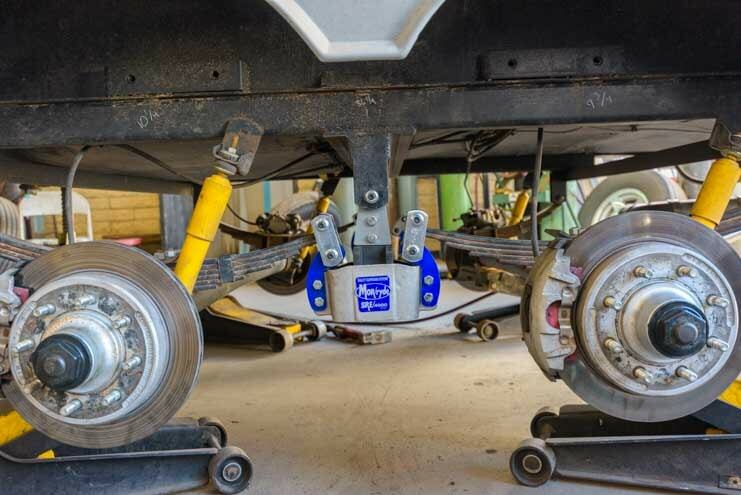 When it comes to suspension, more and bigger ain’t always better 🙂 I would be surprised if the original spec even called for 7,000# springs as your trailer isn’t that much heavier than ours. Did it come new with those beefy springs on it? 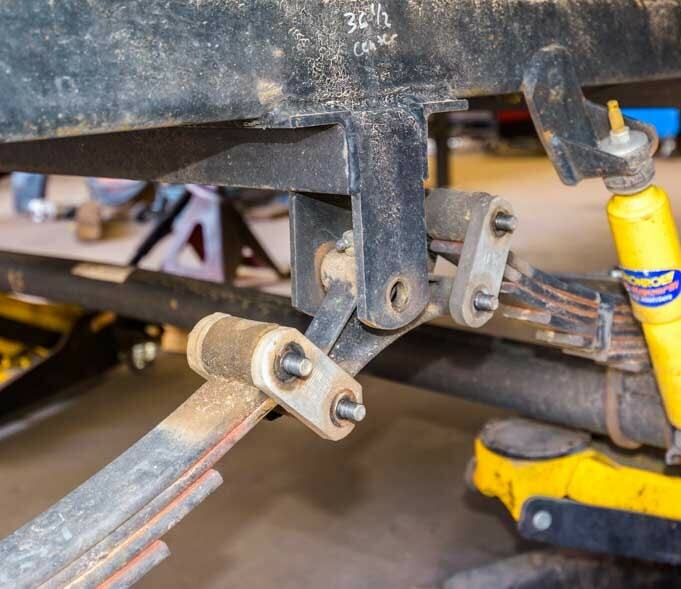 Our original leaf springs were 7000 lb. springs with 6 leaves each. 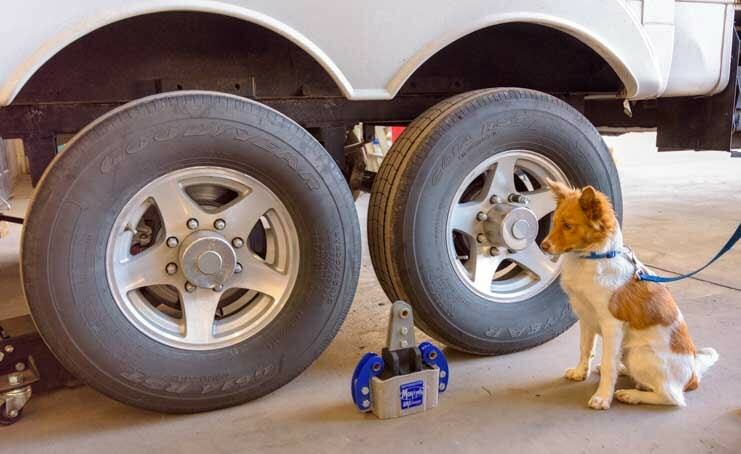 That’s the way NuWa built the trailer and is a large part of what gave it its 14,100 lb GVWR. We had to replace those springs after a few years because they had flattened. We replaced them with 7000 lb. 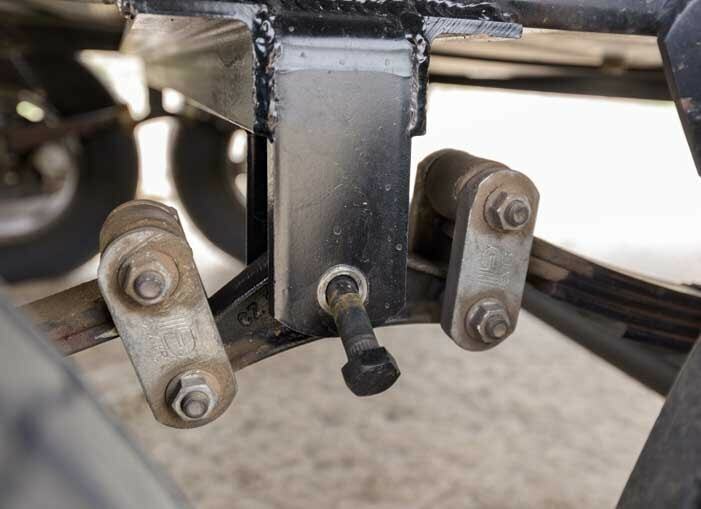 springs that had 6 leaves each to keep the trailer to the original factory specification. 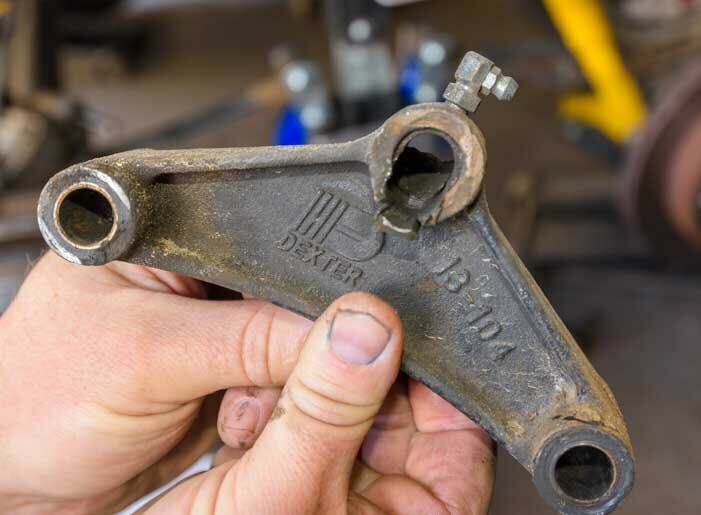 When those new springs flattened after a few years we were advised by the shop that overhauled our suspension to get stronger springs. So, we got 8000 lb. 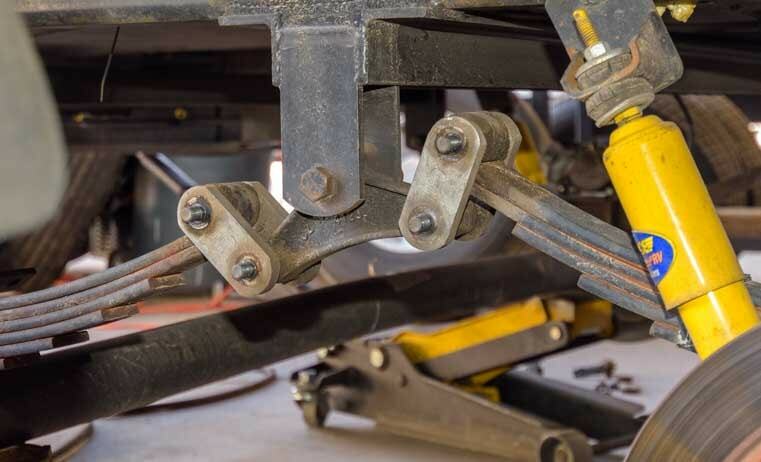 leaf springs with 7 leaves each. 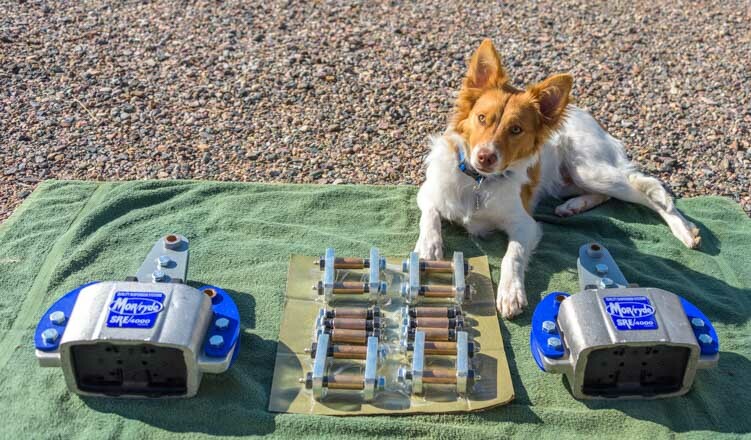 These springs have not flattened. 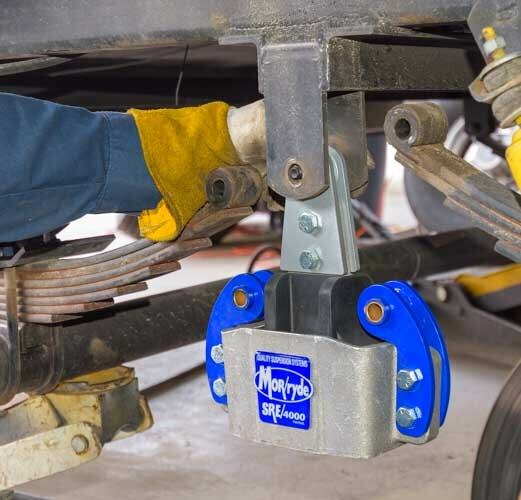 I believe the way leaf springs are rated you have to go in pairs, i.e., a pair of 7000 lb springs on either end of a 7000 lb axle is designed to support 7000 lbs. 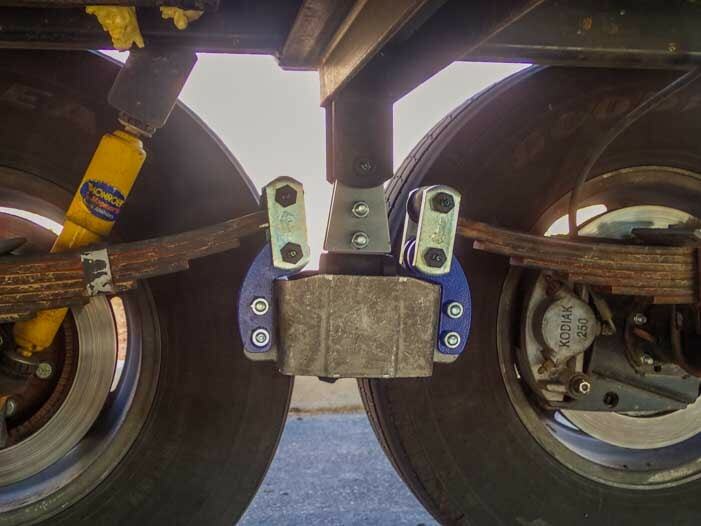 With two of those axle/leaf sets under the rear of the trailer you can support 14,000 lbs. 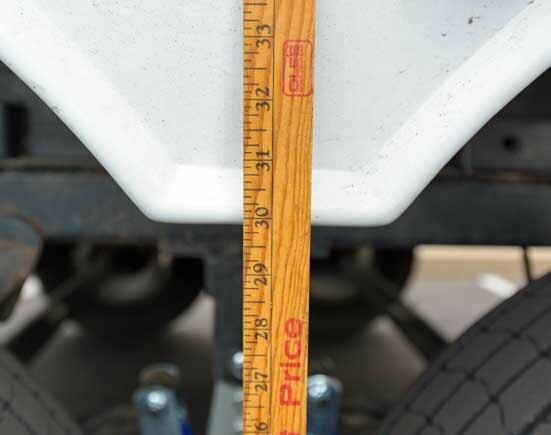 in the rear (and of course about 20% of the trailer weight is over trailer hitch in the bed of the truck). I am not sure how much “bounce” is designed into the rating. That is, the rating is probably for non-bumpy paved roads. 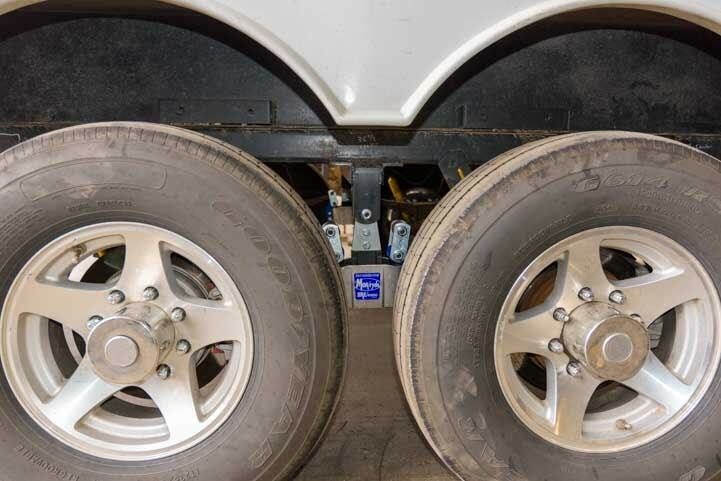 When you hit a pot-hole or go down a rutted dirt road, a 14k trailer will exert a lot more force on its rear axles than on a smooth road. 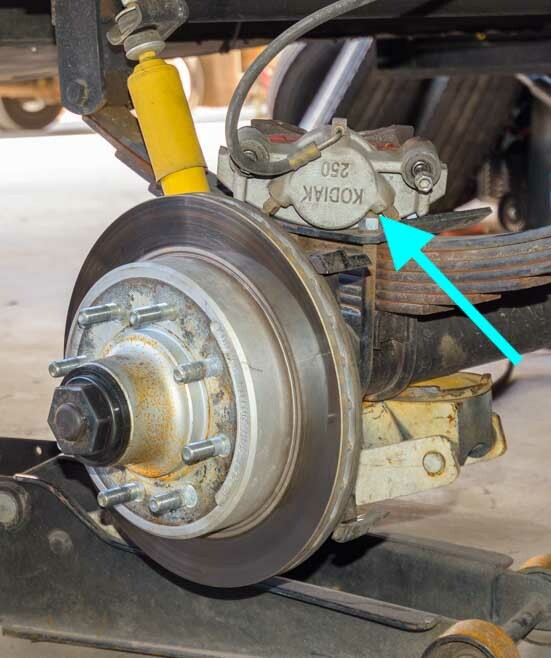 I do not know how much “extra” force is built into the axle and leaf spring rating. 10% more? 25% more? 50% more? I also have no idea when we were airborne on I-10 in Louisiana how much extra force was exerted on our truck and trailer suspension when we landed. 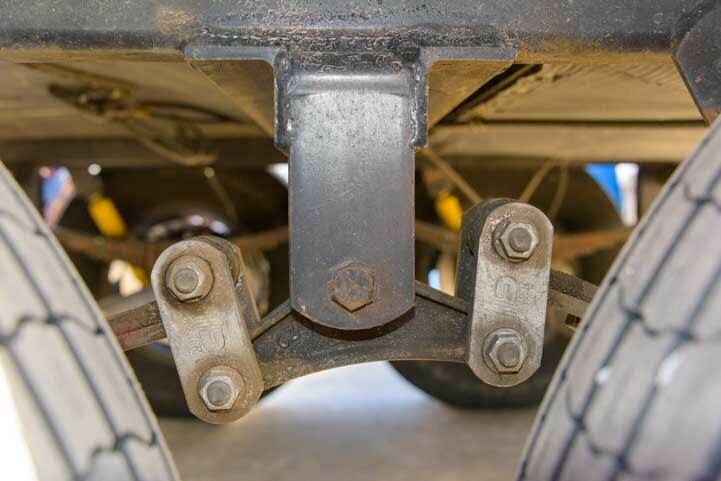 At some point any axle/leaf spring combo will fail if the trailer weight drops on the suspension hard enough. 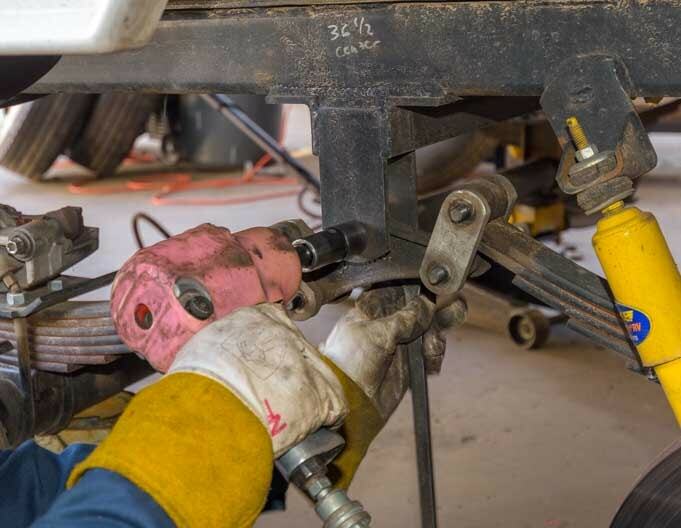 Our goal was just to prevent the premature leaf spring failures we kept seeing. Really appreciate the detailed, well written articles. So thanks for that. 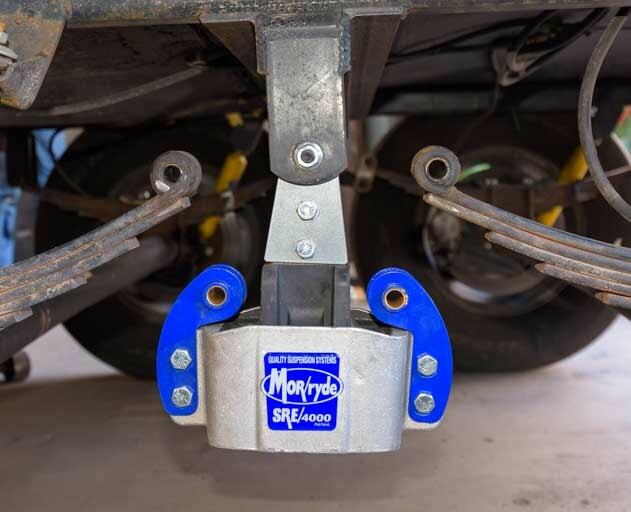 I had hoped to purchase our future fifth wheel with the MORryde 4000 but sadly the brand moved away from it to a Lippert system. 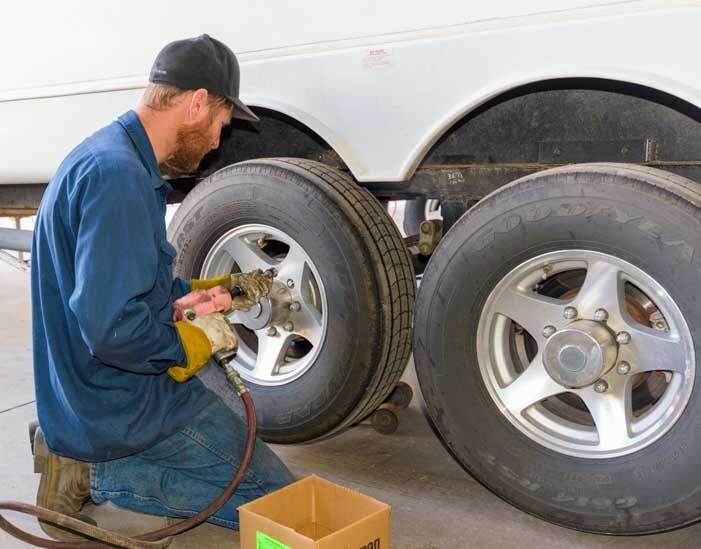 I also noticed your Kodiak brand disc brakes, another good call on your part from what I’ve read about the brand. Over the course of months I’ve bounced around reading your articles. 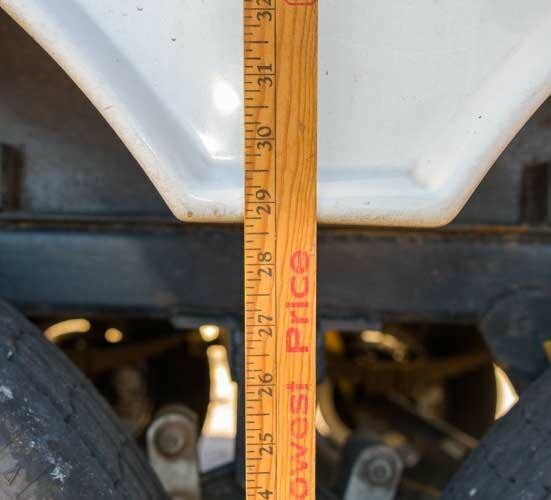 Best write up I’ve ever found on a decision to buy which truck…. You are welcome for the detailed articles, Mark. I am glad to know you have enjoyed them. It takes a crazy amount of time for me to write them and put them together, especially the technical articles (it often takes me 70-100 hours to produce a single article), so hearing from an appreciative reader means a lot. 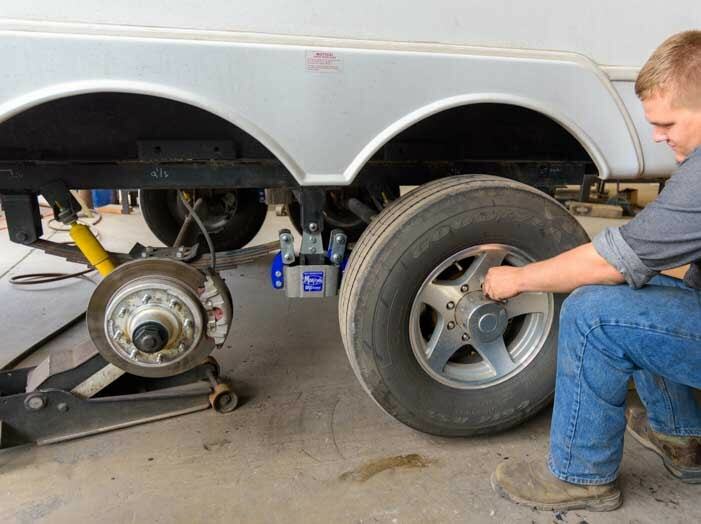 Mark did a lot of research before choosing the Kodiak brand of disc brakes, and we sure love them. 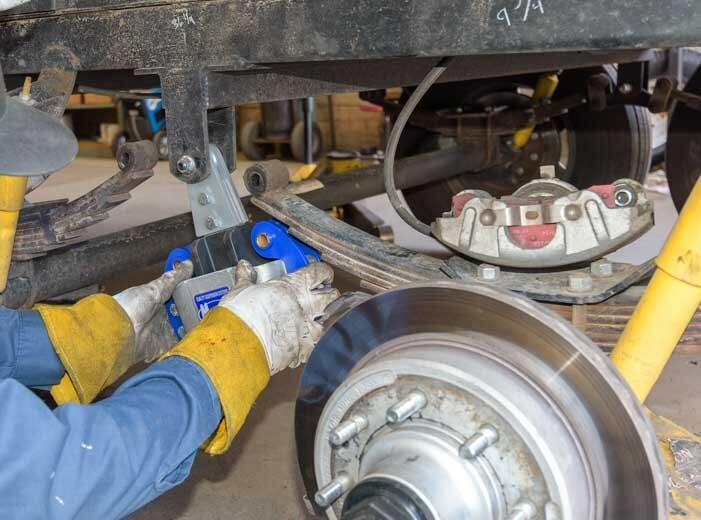 Without a doubt, a disc brake conversion is one of the best upgrades any fifth wheel owner can do. 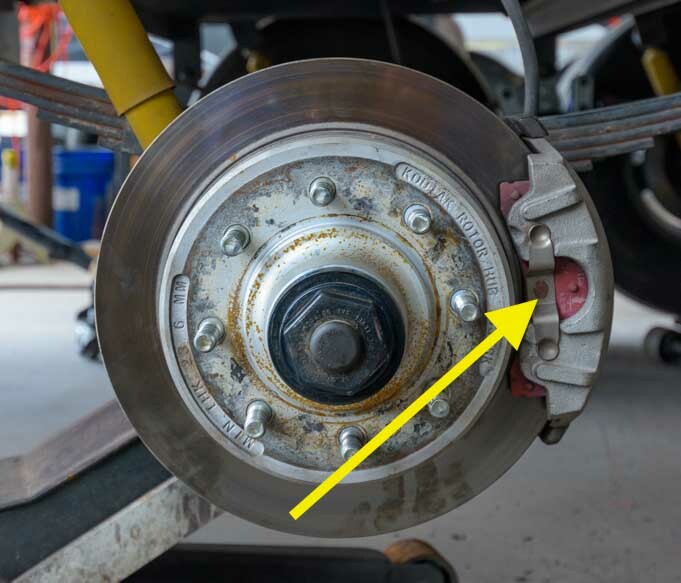 It is an expensive upgrade, but the improved stopping power is stunning (even I can feel the difference sitting over in the passenger’s seat!). 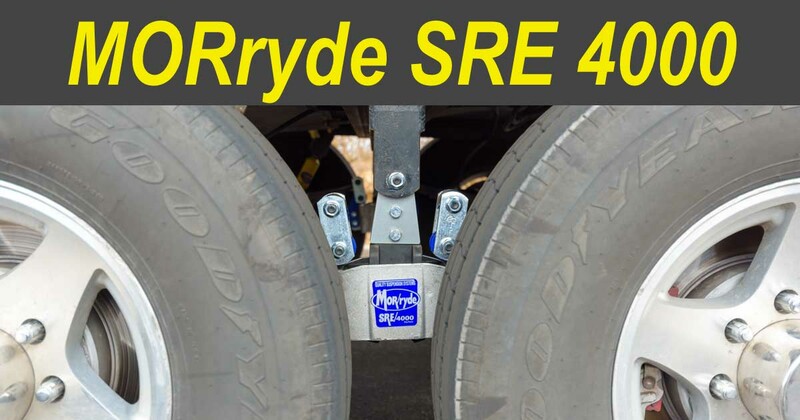 As for the MORryde SRE 4000, if your new fiver doesn’t come with it, you can always add it at a later date. Thank you for the compliments on my article about our Dodge Ram dually. It’s a fabulous truck, and Mark really loves to drive it! I have a 36′ 2011 NuWa Discover America. 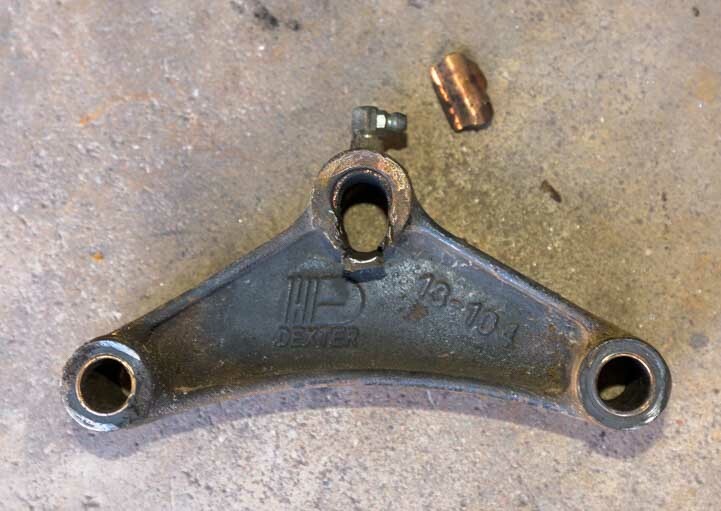 While on my back under the trailer greasing the suspension, I discovered the equalizer hanger that bolts into the welded frame support has two cracks in it. The cracks are each about one inch long coming from opposite sides. There’s about three to four inches of good metal between them. Not sure how much time or what kind of force it would take to make them join each other and cause a massive failure. Thinking of replacing both equalizers with the MORryde SRE 4000x system. My question is about ordering them from Amazon. When you order one MORryde SRE2-733x SRE4000 kit, does that include equalizers for both sides plus the cross member bar for $375? 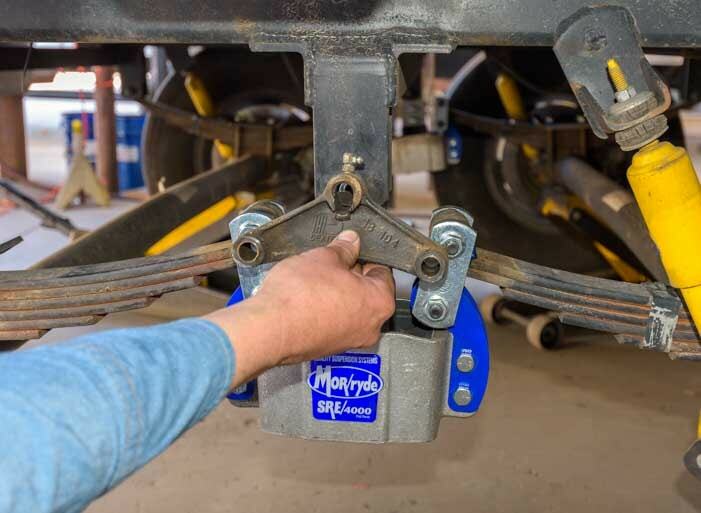 Same question for the heavy duty shackle kit. Does one order give you enough hardware for both sides at $89.57? Wow, that’s a scary pair of cracks, Lew!! I think you’ll be really pleased with the MORryde upgrade. 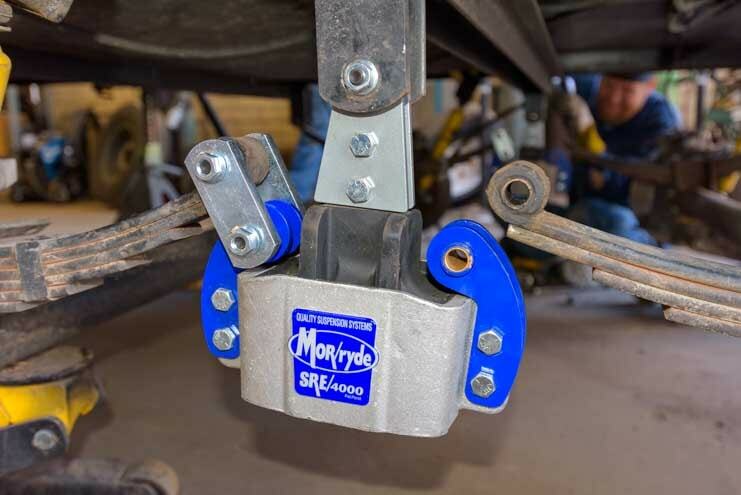 To answer your question, yes the MORryde SRE2-733X includes a pair of equalizers (one for each side) and the crossmember (the key in the part number is that “X”), and the heavy duty shackle kit includes shackles for both equalizers. I hope you enjoy smoother towing like we have! !